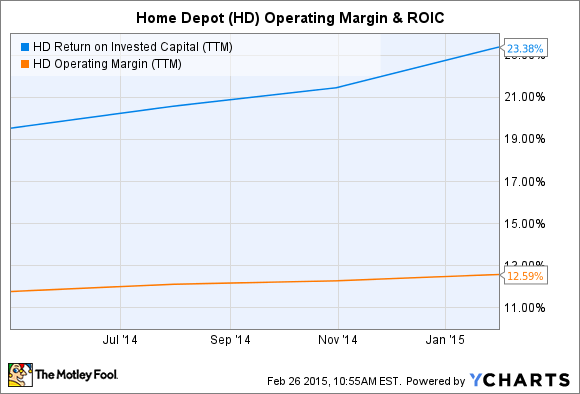 Do Home Depot's Big Buyback and Dividend Hike Make Sense? Home Depot racked up big sales and earnings growth in the fourth quarter, putting it in a generous mood with shareholders. Stronger sales at Home Depot (NYSE:HD) resulted in better-than-expected earnings this week, leading the home improvement chain to offer a more upbeat forecast for the coming year. What investors really liked, however, was the $18 billion share repurchase program and the whopping 26% hike in the company's annual dividend. Home Depot's share are up about 3% since the news. Adjusted earnings for the home improvement retailer were $1 per share in the fourth quarter, as net sales rose more than 8% to $19.2 billion, easily outstripping analyst expectations of just $0.89 per share on $18.7 billion in sales. A stronger economy and an improved housing market accounted for the better performance, which also helped rival Lowe's (NYSE:LOW) post Wall Street-topping results. But Home Depot was able to take market share away from Lowe's even as both posted higher same-store sales. Home Depot said comps came in 7.9% higher companywide in the fourth quarter, but they were up 8.9% at its U.S. stores, which accounts for around 85% of all its locations. Lowe's comps were up 7.3% and 7.9%, respectively. Those muscular results by Big Orange allowed it to shower shareholders with cash in the form of the stock buyback plan and the dividend hike. Home Depot has a history of making big stock purchases, and the new plan is replacing the existing $17 billion program it approved in 2013, which had $1.5 billion remaining on it. In the fourth quarter alone, Home Depot bought back some 80 million shares worth around $7 billion. It's hard to argue with its capital allocation decisions. Over the past five years, Home Depot's stock has appreciated by nearly 270%, suggesting it's been a good steward of shareholder resources and using them appropriately. Even after reinvesting some $1.4 billion back into its business, Home Depot is still able to return substantial amounts of capital to shareholders through dividends. How? The retailer is a prodigious cash-generating machine. Operating cash flows exceeded capital expenditures by nearly sixfold, meaning it generated free cash flow of $6.8 billion -- nearly 9% more than in 2013. During the earnings conference call, management also reiterated its goal of achieving operating margins of 13% along with a 27% return on invested capital by the end of 2015. Its results last year put it within striking distance of both of those marks. While the rebound from the depths of the recession is noteworthy because it indicates housing's continued improvement should further enhance Home Depot's results, not everything was unicorns and rainbows for the big-box retailer. The housing market is seen as generally being in a better place, but it's a very uneven recovery. Sales of existing homes dropped to a seasonally adjusted rate of 4.82 million in January, a 4.9% decline from a year ago and the lowest level since last April. Reuters reports housing activity has been sluggish since the middle of 2013 because of tight inventories and rising rates, which have put off first-time home buyers, meaning the situation might not improve until the back half of this year. During the call with analysts, Home Depot also mentioned its better performance may have actually been due to the more robust activity in housing in 2013. It referenced a study that showed there could be as much as a 12-month lag between housing's results and when it shows up elsewhere. If true, that could make the coming year a challenging one for the big-box store. Home Depot also noted that its guidance didn't take into account any costs related to its customer credit data breach. While much of Home Depot's success has been a result of housing's recovery, it's future depends on it continuing to heal. Photo: Flickr via Concrete Forms. All of this suggests the home improvement center was right to keep shooting for a 50% payout ratio for its dividend. The increase it approved raises the annual dividend to $2.36 a share, equating to a 2% yield, and is in line with that targeted number. The payout ratio is calculated by dividing the dividends per share a company pays by its per-share earnings. Expressed as a percentage, lower is generally better, and any company with a ratio exceeding 100% is paying out more in dividends than it makes in profits. Typically, a payout ratio below 75% is considered safe, and lower percentages give a company more room to increase its dividend in the future. A payout ratio of 50% also means its earnings could be cut, and the dividend is still covered. For a big, mature business like Home Depot, paying out half its earnings to shareholders still represents a lot of money, but the action allows it to continue investing in its business while considering further increases in the future. Home Depot has proven itself to be particularly adept at shepherding shareholder resources into productive uses in the past, and it appears ready to deliver even better returns to investors tomorrow.